The Pomegranate fruit is associated with luck, fertility, and prosperity, as well as renewal, passion, and strength. Persephone the Greek goddess of Spring is also associated with the pamgranate, as well as the garnet due to the seeds resemblance to the precious stone. Anoint a pomegranate candle with patchouli oil to help draw good fortune and wealth while increasing fertility and passion. 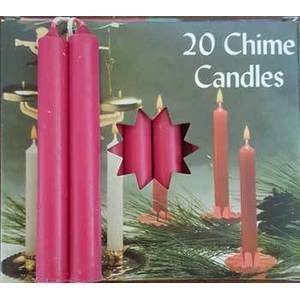 This is a single box of 20 chime sized candles 3/8 of an inch by 4 inches in length.